The TRB-800 model has been discontinued. Please see the TRH-2020 Series as a possible alternative or contact our Flow Engineering Department. The model TRB-800 measures the amount of suspended particles in water and meets U.S. Environmental Protection Agency (EPA) requirements for testing drinking water. This nephelometric instrument reads the amount of incident light reflected at a 90° angle from light source. The reflected light is proportional to the amount of suspended particles in the water. 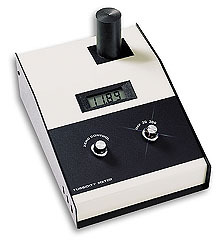 With two full scale ranges of 20 and 200 NTUs (nephelometric turbidity units) and only two controls (zero control and range selector switch), the TRB-800 is very easy to use. Included with each instrument are Formazin for making a standardizing solution, a filter/syringe assembly, six sample vials, sample cup, permanent secondary standards of 0 and 10 NTU, and a rechargeable battery pack (providing 90 minutes of continuous operation), all housed in a rigid vinyl carrying case. Please download PDF file for full specifications and a complete list of available accessories. 참고: Comes with Formazin, filter/syringe assembly, six sample vials, sample replacement cup, rechargeable battery pack, secondary standards of 0 and 10 NTUs, and operator’s manual in luggage-type carrying case.